Thomas Creek Ranch Salmonid Enhancement Design | Prunuske Chatham, Inc. 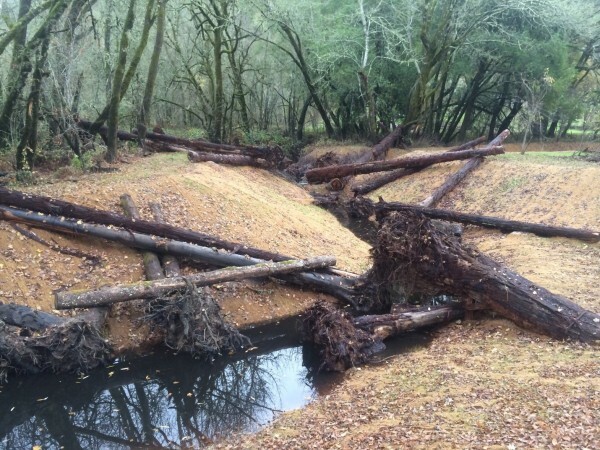 The residents of Thomas Creek Ranch offered to host a salmonid habitat enhancement project along their stretch of lower Green Valley Creek, a tributary to the Russian River. In cooperation with the Gold Ridge Resource Conservation District and a Technical Working Group for the creek, PCI developed conceptual and construction plans to provide winter rearing and refugia habitat for juvenile salmonids, creating a low-velocity environment with fixed shelter elements and dense vegetative cover. The project included the construction of a side channel through the floodplain and a large ponded area/seasonal wetland adjacent and connected to the side channel. Other project elements included the installation of large woody debris in the channels and site revegetation. Upon maturity, the project will provide the structurally complex, vegetated edge habitat needed by juvenile salmon to survive and thrive during winter high flows – habitat once provided by seasonally inundated, floodplain wetlands.